On February 23 we sponsored medical Rounds at North York General Hospital. The topic was physician assisted death. The room was set up to accommodate 70 participants. At least twice that number squeezed in to hear this very timely talk. North York General Hospital rounds on physician assisted death. Some of the fortunate who found seats at this well attended session. Dr. Leung clarified terminology around physician assisted death, gave an update as to where the legislation stands presently and addressed questions from the audience. He reviewed the challenges that have been made over the years to the Charter of Rights in regard to the right to seek physician assisted death. Last year the Supreme Court ruled that the law banning physician assisted death was unconstitutional and that Canadians with unbearable and irremediable suffering could be eligible to end their life with a doctor’s aid. He listed the interim guidance that is in place currently. And the many undefined terms. Must be a competent adult. Must have a grievous and irremediable medical condition. it does not say terminal illness. a person does not have to accept treatments that are not acceptable to them. May be enduring suffering that they find intolerable. The guidance does not define the age at which one is considered an adult. Nor does it list which kinds of cognitive tests might be administered in order that a person might be defined as competent. The guidance states that advance directives are not advised as acceptable direction from a competent adult. A man and woman were hiking in the woods. She had been recently diagnosed with mild cognitive impairment. According to the man, during their hike, the woman produces a full vial of some type of medication which she has acquired. She proceeds to ingest all of the pills and dies. Some physicians may not, for a variety of reasons, be comfortable in the role of assisting death. There is a provision in the interim guidance for a physician to state a conscientious objection. However there is also a duty to refer the patient to another provider. In today’s paper we learned that a special Parliamentary committee will propose that Parliament adopt a new physician-assisted dying law that includes advance consent for people in early stages of dementia. The report is to be tabled in Parliament on Thursday. There’s no doubt that many Canadians want access to medical assistance at the end of life; whether for palliative care or assisted death. Canadians are not the first to consider adopting this concept. We can learn lessons from practitioners in other parts of the world where access to medical assistance at the end of life is more commonplace. The complicated details surrounding the legislation of physician assisted death will not be close to sorted out by the target date of June 6, 2016. But there’s no doubt that the conversation has begun and in any gathering where the discussion takes place, it’s bound to be standing room only. 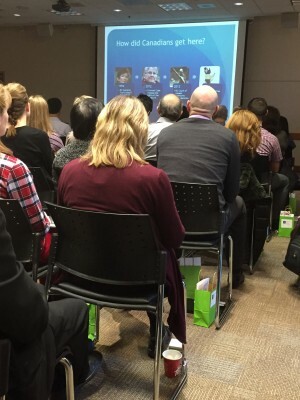 This entry was posted in Blog and tagged Dr. D Leung, Dr. Leung, Medical Grand Rounds, North York General Hospital, physician assisted death, Physician Assisted Dying, Rounds. Bookmark the permalink. Your parent deserves the best senior care possible. That’s why we hire only 2% to 5% of the caregivers who apply to work with us. ← Grandparents sharing interests with their grandchildren = amazing adventures!